How would you survive the apocalypse? 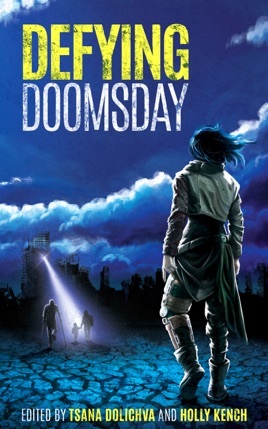 Defying Doomsday is an anthology of apocalypse fiction featuring disabled and chronically ill protagonists, proving it’s not always the “fittest” who survive – it’s the most tenacious, stubborn, enduring and innovative characters who have the best chance of adapting when everything is lost. In stories of fear, hope and survival, this anthology gives new perspectives on the end of the world, from authors Corinne Duyvis, Janet Edwards, Seanan McGuire, Tansy Rayner Roberts, Stephanie Gunn, Elinor Caiman Sands, Rivqa Rafael, Bogi Takács, John Chu, Maree Kimberley, Octavia Cade, Lauren E Mitchell, Thoraiya Dyer, Samantha Rich, and K L Evangelista. I want to read more!!!! I pre ordered this book because of one author, not knowing anything else, and unexpectedly found a book full of stories that I loved. Usually in an anthology there are stories that you skip or just don't care for, but I was surprised to find that I really enjoyed all 15, and now have new authors to read. I also kind of hope some of these stories end up as a longer book, because I ended up wanting to know what happens next, "Did we break the end of the world", while a fully resolved story, could continue for a bunch more chapters!